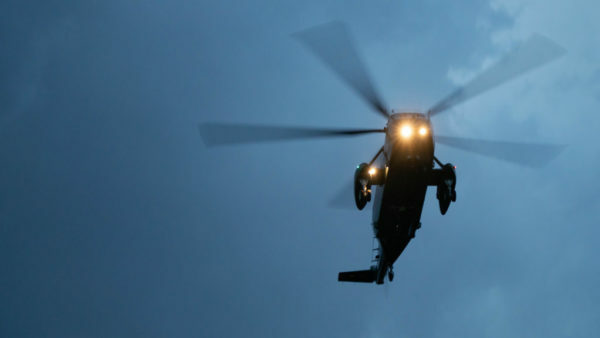 (Updated at 10:45 p.m.) About a year ago at this time, Arlington looked to be in serious trouble down in Richmond. In mid-March 2018, county officials faced the decidedly unpleasant prospect that they’d come out on the losing end of a bruising legislative battle with two local golf and country clubs. One of the county’s foremost foes in the General Assembly had engineered the passage of legislation to slash the clubs’ tax bills, potentially pulling more than a million dollars in annual tax revenue out of the county’s coffers. Arlington had spent years tangling with the clubs, which count among their members local luminaries ranging from retired generals to former presidents, arguing over how to tax those properties. Yet the legislation from Del. Tim Hugo (R-40th District) would’ve bypassed the local dispute entirely, and it was headed to Gov. Ralph Northam’s desk. That meant that Arlington’s only hope of stopping the bill was convincing the governor to strike it down with his veto pen. In those days, long before evidence of Northam’s racist medical school yearbook photos had surfaced, the Democrat was well-liked in the county. He’d raised plenty of cash from Arlingtonians in his successful campaign just a year before, and had won endorsements in his primary contest from many of the county’s elected officials. Yet the situation still looked dire enough that the County Board felt compelled to take more drastic steps to win Northam to their side. The county shelled out $22,500 to hire a well-connected lobbying firm for just a few weeks, embarking on a frenetic campaign to pressure the governor and state lawmakers and launch a media blitz to broadcast the county’s position in both local and national outlets. That push was ultimately successful — Northam vetoed the bill last April, and the county struck a deal with the clubs to end this fight a few weeks later. An ARLnow investigation of the events of those crucial weeks in spring 2018 sheds a bit more light on how the county won that veto, and how business is conducted down in the state capitol. This account is based both on interviews with many people close to the debate and a trove of emails and documents released via a public records request (and published now in the spirit of “National Sunshine Week,” a nationwide initiative designed to highlight the value of freedom of information laws). Crucially, ARLnow’s research shows that the process was anything but smooth sailing for the county, as it pit Arlington directly against the club’s members. Many of them exercise plenty of political influence across the region and the state, and documents show they were able to lean heavily on Northam himself. And, looking forward, the bitter fight over the issue could well have big implications should similar legislation ever resurface in Richmond. Arlington County Board member Katie Cristol says she’s running for re-election, becoming the first candidate to jump into the race for two Board seats on the ballot this fall. 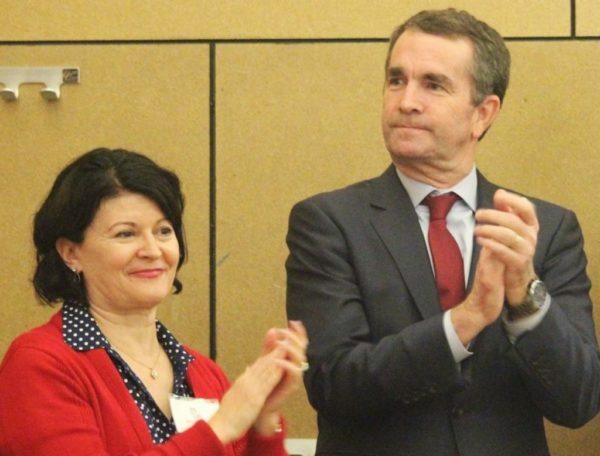 The Democrat, who is a fresh off a year rotating in as chair of the five-member Board, told ARLnow that she announced her decision to seek a second term in office to supporters today (Thursday). Since first winning office in 2015, Cristol believes the county has “started to make progress on the issues I’m passionate about,” but she’s hoping for another four years on the Board because she sees more work left to do on everything from expanding affordable housing options to increasing the availability of childcare in the county. 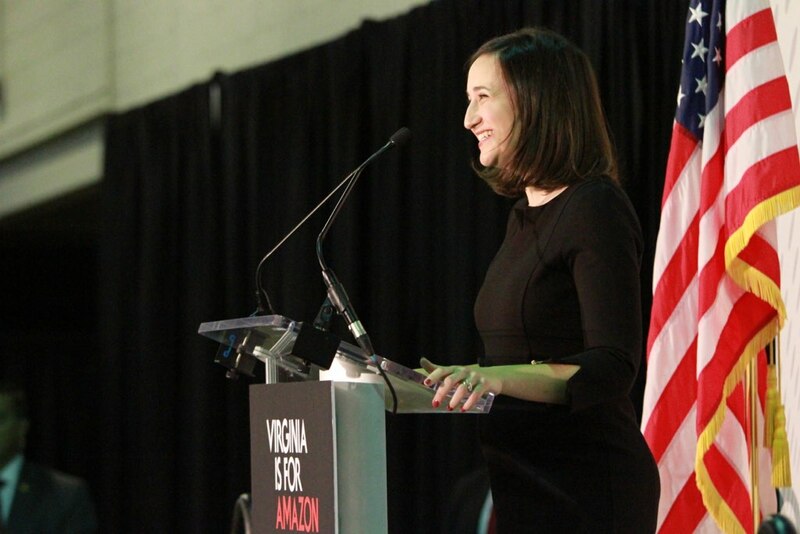 Cristol says she’s well aware that the next four years will be challenging in Arlington, particularly as the Board copes with some unpleasant budgets and manages Amazon’s arrival in Crystal City and Pentagon City. The latter topic has drawn more than its fair share of attention to the county, and Cristol in particular, over the last few months, but she plans to embrace the complexities of the company’s impact during her campaign. Cristol points out that, without Amazon bringing its new headquarters to the county, she’d face the similarly unpleasant prospect of running for re-election as the county grapples with a 20 percent office vacancy rate, which became a key issue during Democrat Matt de Ferranti’s successful campaign to oust independent John Vihstadt last year. Even still, Cristol acknowledged that Amazon won’t be the answer to all of the county’s fiscal challenges as she asks for another four years on the Board. Officials have repeatedly warned that it could take years for the county to see tax revenues from Amazon’s new office space, requiring a mix of tax hikes and service cuts in the new fiscal year to fill a hefty budget gap. Cristol concedes that “as would any elected official, I’d prefer to be cutting taxes and expanding services in a re-election year.” But she also believes that her chairmanship of the Board last year, when it managed to avoid any tax increases in favor of a handful of spending cuts, demonstrates that she can govern in a “sustainably progressive” manner despite the fiscal headwinds. Though Cristol is the only candidate in the race so far — County Board Chair Christian Dorsey has yet to announce whether he’ll seek re-election — she’s well aware that she could face a more difficult race this year than when she last ran four years ago. In that contest, Cristol and Dorsey easily triumphed over independents Mike McMenamin and Audrey Clement. But this time around, Cristol could well find herself squaring off against her former colleague Vihstadt, who recently thrust himself back onto the county’s political scene with his renewed criticism of costs of the Long Bridge Park Aquatics Center project. For her part, Cristol says she doesn’t know whether Vihstadt plans to mount another independent bid. In an election year without any statewide races at the top of the ticket, she says his entry into the race would present an “interesting question” of political strategy, but she’s not spending too much time worrying about it quite yet. It’s unclear whether Cristol could face Democratic primary challengers before she even reaches the general — Commonwealth’s Attorney Theo Stamos, state Sen. Barbara Favola (D-31st District) and Del. Alfonso Lopez (D-49th District) have all drawn primary opponents thus far in Arlington’s local races — but any primary would be quite different from the six-way race she won four years ago. In 2015, Cristol ran as a young newcomer to county politics, beating out some more experienced candidates. This time around, she has a record to defend, but also experience to run on. Cristol says she’ll make a formal announcement at the Arlington County Democratic Committee meeting next Wednesday (Feb. 6), with a campaign kickoff event later that month. 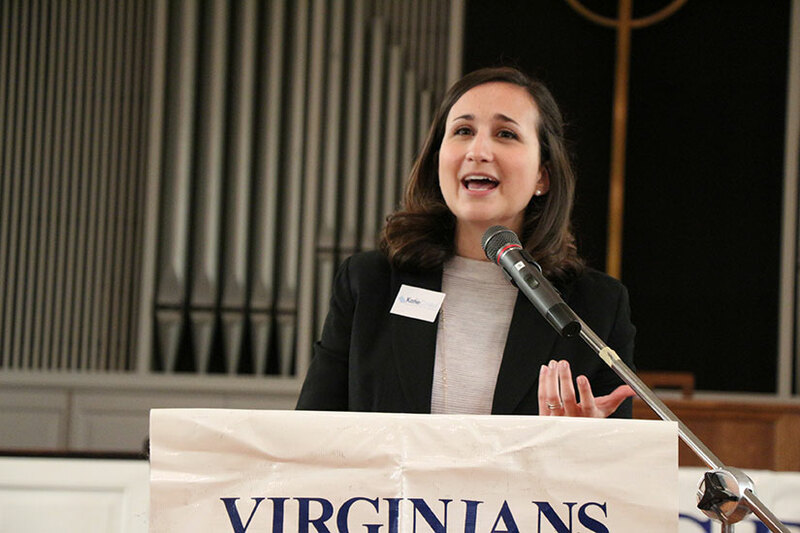 Arlington County Board Chair Katie Cristol is joining a statewide push for more education funding, calling on the General Assembly to send more cash to local school systems. Cristol, a Democrat, is standing with leaders from 10 other Virginia localities in supporting the “March for More,” a demonstration in Richmond set for this Saturday (Dec. 8). Richmond Mayor Levar Stoney (D) is coordinating the effort and has made school funding a key focus of his administration. The march is primarily focused on convincing state legislators to reverse cuts to K-12 education funding they made at the height of the Great Recession. Its supporters argue that the state’s failure to restore those funds and keep pace with rising enrollment levels have put a huge strain on local governments, which bear the burden of funding their school systems. For fiscal year 2019, state funds accounted for about 12 percent of the roughly $640 million that Arlington Public Schools took in in revenue, while the county accounted for about 78 percent of that amount. However, there are plenty of factors accounting for Arlington’s small share of state funding — officials dole out money based on each locality’s “ability to pay,” a statistic that the state calculates by evaluating factors like property values, income levels and taxable retail sales. The county performs quite well relative to other Virginia localities on all of those measures. But the “March for More” advocates point out that state law obligates the General Assembly to fund 55 percent of the costs of meeting the state’s “Standards of Quality,” which govern everything from class sizes to facility maintenance schedules, but Richmond has fallen far short of meeting that standard. As of 2017, the state combined to meet just 43 percent of school funding needs statewide. Similarly, research from the left-leaning Commonwealth Institute for Fiscal Analysis suggests that state funding is down 9.1 percent per student compared to pre-recession levels. Arlington officials are particularly interested in a little budget relief, given the county’s current fiscal challenges. County leaders are considering everything from tax increases to staff layoffs to help meet a projected $78 million budget gap, which is driven in part by a $43 million deficit that the school system is facing. The school system only narrowly avoided increasing class sizes in this year’s budget, and may have to consider such a measure again in fiscal year 2020. How might lowly local officials be able to bring one of the world’s largest companies to heel? That’s the prime question on the minds of many Arlington and Alexandria residents worried about how Amazon might soon reshape their communities. And while county and city leaders are optimistic that the tech giant will prove to be a reliable partner in the region, they’re also admitting that they don’t have all that many tools to push Jeff Bezos and company around. “We have to focus on using the policy tools that we do have,” said County Board Chair Katie Cristol at an Amazon-focused town hall in Crystal City’s Synetic Theater last night (Monday). 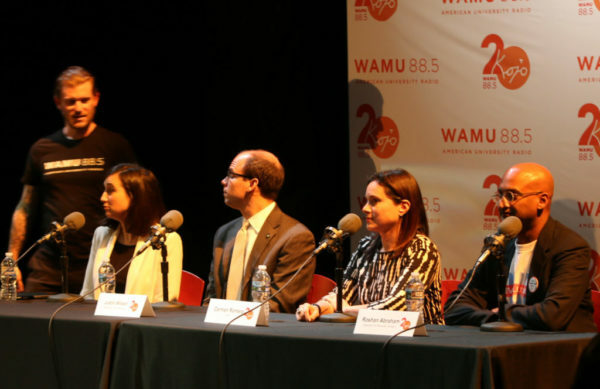 Public speakers at the event, which was hosted by WAMU 88.5’s Kojo Nnamdi Show, fretted over how localities might address everything from the company’s labor practices to its commitment to hiring a diverse workforce. 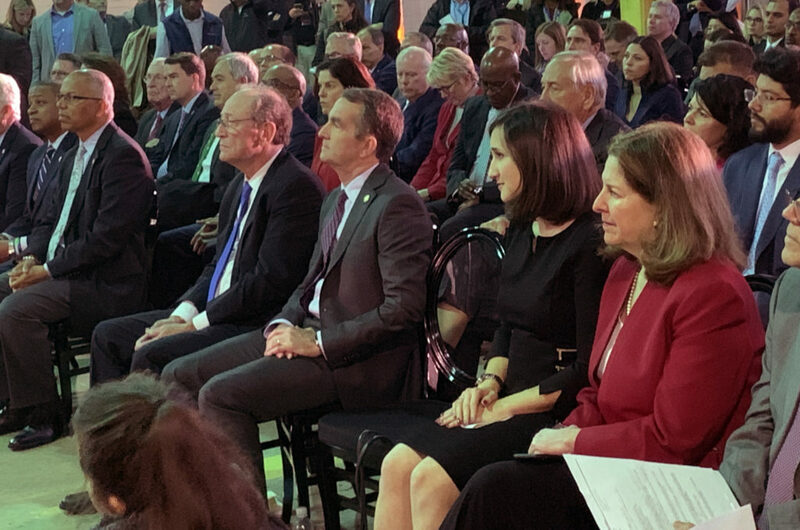 Leaders in attendance sought to reassure nervous neighbors that localities will be able to extract community benefits from the company as it builds new space in Pentagon City and Crystal City. County Board member Libby Garvey even expressed optimism that “Amazon is going to affect us, but we’re going to affect Amazon too” when it comes to changing the company’s culture. But concerns abound that Amazon’s status as the new economic engine for the area will give it unprecedented bargaining power in any dispute with local leaders. Part of the problem for local leaders is that state law limits their ability to pursue some of the most aggressive pro-worker measures favored by Amazon skeptics. Virginia’s legislature, long dominated by Republicans, has adopted a series of measures designed to make the state more business friendly — perhaps most notably, Virginia is a “right to work” state, limiting the ability of unions to charge workers fees for representing them. Several members of local unions urged officials to press Amazon to sign “project labor agreements” ahead of any new headquarters construction, or a contract with a union to lay out the working conditions for a project before construction gets started. But Virginia has laws on the books designed to limit government agencies from requiring such agreements, and Cristol pointed out that “the state has made it very clear that we can’t use those” in many situations. However, she did pledge to urge Amazon to work with unions and offer fair working conditions on its construction sites — and the question gave her a chance to underscore just how meaningful it might be if her fellow Democrats seized control of the General Assembly in next year’s elections. Other attendees were similarly nervous that the county won’t be able to force Amazon to fork over cash to spur the development of more affordable housing, particularly as the arrival of the company’s planned 25,000 workers strain the region’s housing market. On that front, however, Arlington officials are confident that they’ll be able to use their existing development process to require Amazon to chip in more money for its Affordable Housing Investment Fund, a loan program designed to incentivize reasonably priced development. Of course, that will have to wait until the company starts building new facilities, which could take years yet. In the meantime, housing advocates are optimistic that the tech giant is committed to the issue of housing affordability, and could agree to some select contributions on its own. Carmen Romero, vice president of real estate development with the Arlington Partnership for Affordable Housing, said both Amazon and its major landlord in Arlington (JBG Smith) have told her they “want to be at the table” when it comes to discussions about creating new affordable developments. She even suggested that JBG could agree to donate some small portion of the large swaths of land it owns in Crystal City and Pentagon City to a nonprofit like her group, allowing for new affordable homes in the immediate vicinity of the headquarters. Alexandria Mayor-elect Justin Wilson added that the mere fact of Amazon’s interest in the region has already changed the conversation at the state level. He noted that state lawmakers were previously reticent to commit to major affordable housing funding, despite Northern Virginia leaders “banging our heads against the wall in Richmond,” but officials agreed to send an additional $15 million to the Virginia Housing Development Authority as part of the offer to Amazon. For Amazon opponents, however, it’s not enough that the company and state might voluntarily agree to measures to offset the impending impacts on the county. Abraham’s group is pushing the concept of a “community benefits agreement,” a deal that a coalition of neighbors would strike directly with the company to ensure it invests in the community’s priorities, as an alternative to government officials haggling on their behalf. It may not be enough to answer all their concerns, but he expects it may be a better path to pursue than hoping local politicians can win battles with a company owned by the world’s richest man. “If we get Amazon to make these commitments to our community now, that, I believe, is the best way we have of protecting ourselves,” Abraham said. 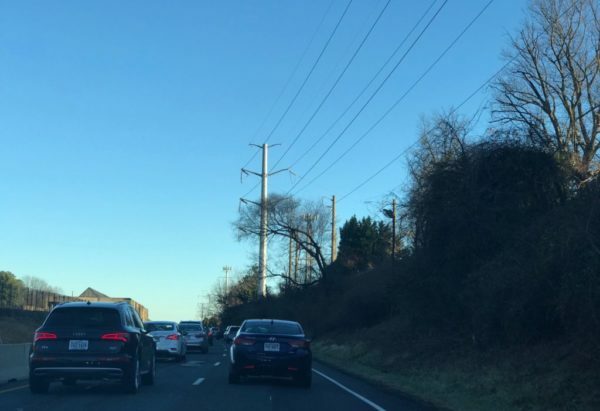 Amazon’s new headquarters will fundamentally transform Arlington in the years to come, but county officials are hoping to reassure residents that the area won’t change in the blink of an eye. Instead, Arlington leaders are painting the arrival of the tech giant — and the 25,000 workers set to someday occupy its new office space — as a development that will shape the county’s economic landscape over time, rather than overnight. And, they hope, that will give the county time to prepare accordingly. “This is not going to feel like a tsunami of new people on our streets or kids in our schools,” County Board Chair Katie Cristol said during a question-and-answer session live-streamed on Facebook last night (Tuesday). Critics of the county’s courtship of Amazon have long feared the impact that thousands of highly paid workers arriving in the region could have on everything from home prices to school overcrowding. But Arlington leaders have often countered that the region is experiencing dramatic growth at the moment, and seems set to see even more in the future, meaning that Amazon’s arrival might not seem especially out of place. Now that Jeff Bezos and company have made the big decision, targeting Crystal City, Pentagon City and Potomac Yard for half of its proposed second headquarters, officials remain confident in those predictions. Cristol, for instance, noted Tuesday that the tech company could draw as much as 15 to 20 percent of its new workforce from current county residents. “They located here because they want access to the tech talent we have here,” Cristol said. As for the rest of the new Amazon staffers, Arlington Economic Development Director Victor Hoskins pointed out that they won’t be arriving on the county’s doorstep next week, or even next month. Under the terms of the company’s proposed deal with the state, Amazon would only hire about 400 workers for the new Arlington campus next year. That number will ramp up sharply over time, however, leaping to 1,180 new staffers in 2020 and then 1,964 workers the year after. But Hoskins noted that the pace of change would’ve been even more dramatic had Amazon stuck with its original plan to house all 50,000 workers in one city, rather than splitting “HQ2” between Arlington and New York City. For parents nervous about how many kids those new workers will bring with them, Cristol is also optimistic that the school system will be able to handle the influx of students. She expects that the county will only see two to three additional students in each school per year, and that’s only when Amazon fully ramps up hiring in the coming years. Depending on how the county is calculating that figure, such an increase would work out to anywhere from 70 to 105 new students enrolled in Arlington Public Schools each year, at a time when the school system is already struggling with severe financial pressures to match rising enrollment. But Schwartz noted that, under the county’s revenue-sharing agreement with APS, roughly half of the tax revenue that Amazon generates will flow into the school system’s coffers. He estimates a $315 million increase in tax revenue over the life of the county’s deal with Amazon, which beats county projections by about $160 million between now and 2030. Of course, Schwartz says the county will still feel some pain in the short term. Though Amazon represents a tax windfall for Arlington, he warned that it will take time for the county to feel the benefits — and that means that painful measures like layoffs, service reductions and tax increases remain on the table for the county’s new budget. “We’ve been through several difficult budget years and we have a couple more to bridge to where we’re going to be,” Schwartz said. 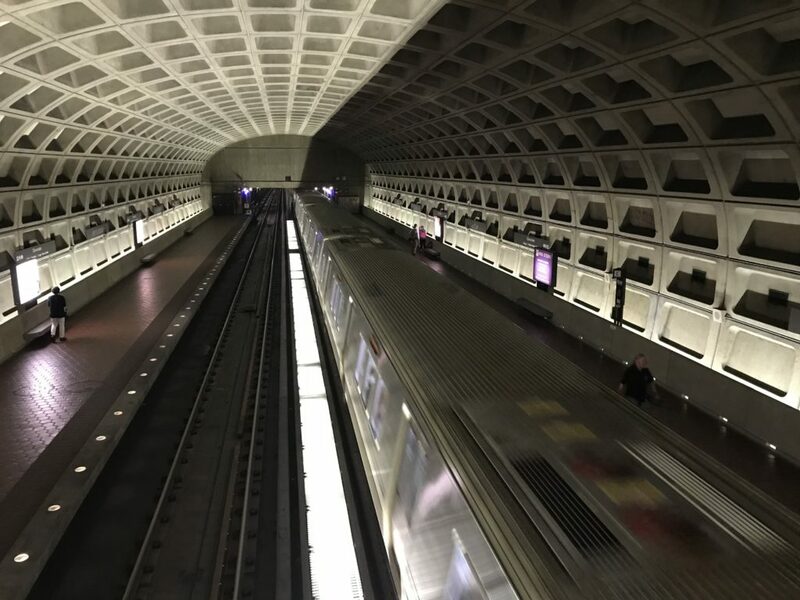 Cristol acknowledged that there are some “difficult short-term conversations” on the way in the county, particularly as Arlington tries to prepare for Amazon’s impact without the tax revenues it needs to fund necessary projects and services. But she also pledged to be open to having those difficult discussions. Some Amazon skeptics have already called on the Board to hold multiple town halls focused on Amazon alone, and Cristol said officials plan to do so, and more. Nestle is now in line to earn half of the $4 million in local grants Arlington promised the company in exchange for moving to Rosslyn, after meeting the county’s targets to qualify for the incentives. In all, the packaged food giant will receive $12 million in cash and infrastructure improvements after agreeing to relocate its corporate headquarters to 1812 N. Moore Street last February. But the money did come with some strings attached, forcing the company to prove that it will create 748 new jobs with an average annual salary of $127,719 in the county and lease at least 205,000 square feet of office space by the time 2020 arrives. Only $4 million will come from the county itself, through a “Economic Development Incentive” grant, while a $6 million state grant and $2 million in nearby infrastructure construction round out Arlington’s deal with Nestle. Even still, the grants have become a hot-button political issue around the county, with plenty of observers questioning whether the incentive money might’ve been better spent elsewhere. So far, at least, the company seems to be holding up its end of the bargain. 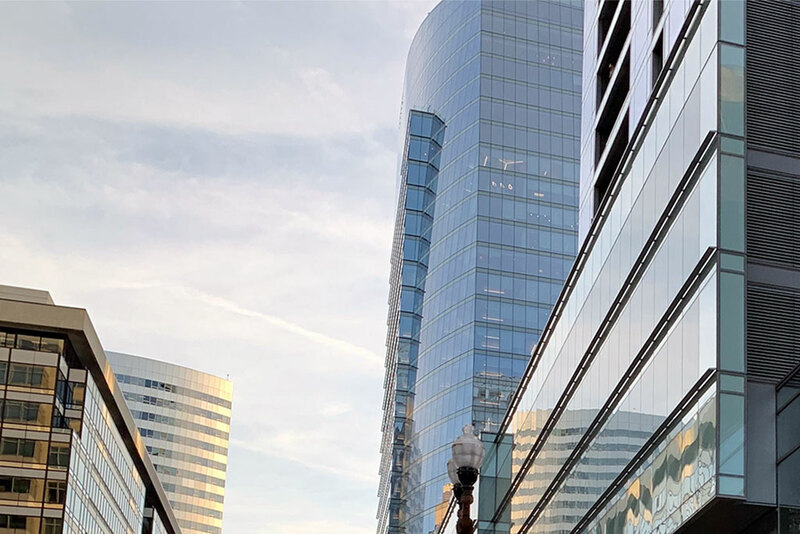 According to documents released through a Freedom of Information Act request, Nestle has created and maintained 358 new jobs at the Rosslyn office, and has leased 229,000 square feet of space in Rosslyn through June 30. Daniel Nugent, chief legal officer and general counsel for the company, signed a July 18 affidavit attesting to those statistics. That means the company has well exceeded its office space requirement to earn the grant money, but fell just short of the 374 new jobs it needed to create by the time June 30 rolled around. 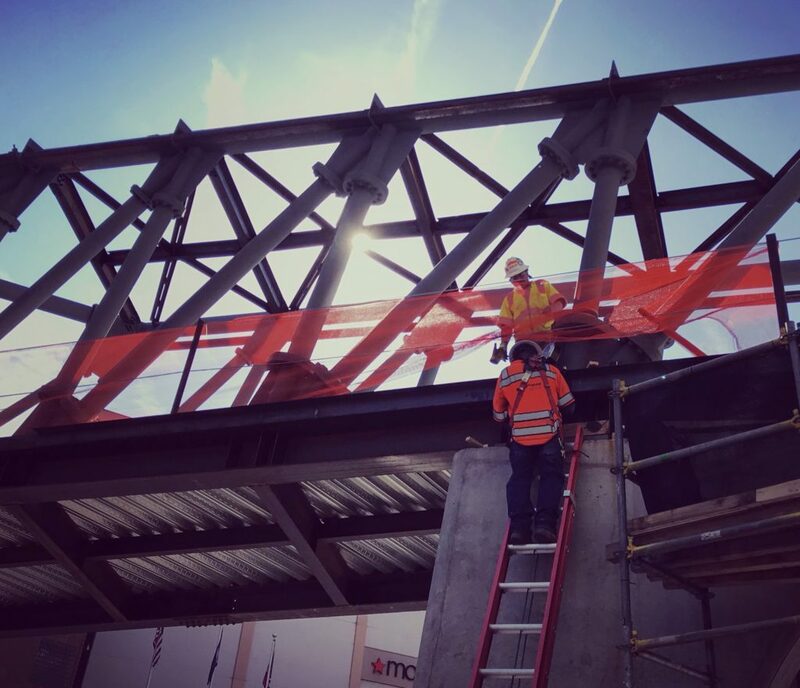 However, Cara O’Donnell, a spokeswoman for Arlington Economic Development, noted that the company only needed to hit 90 percent of the grant’s requirements to earn the money. Accordingly, the county will now release $2 million to Nestle. Josh Morton, a spokesman for Nestle, added that the discrepancy in the job figure is because “the number is always changing as more people are hired in Arlington.” In July and August alone, he says the company hired another 125 employees. “We’re not going to do something speculative where we’re giving away the public’s money without a lot of confidence that we’ll see that money return to us well in orders of magnitude beyond what we invested,” Cristol said. Cristol is well aware what kind of controversy the Nestle incentives kicked up after the Board approved them last year, and how the prospect of similar grants going to Amazon to bring HQ2 to Arlington has roiled the community. 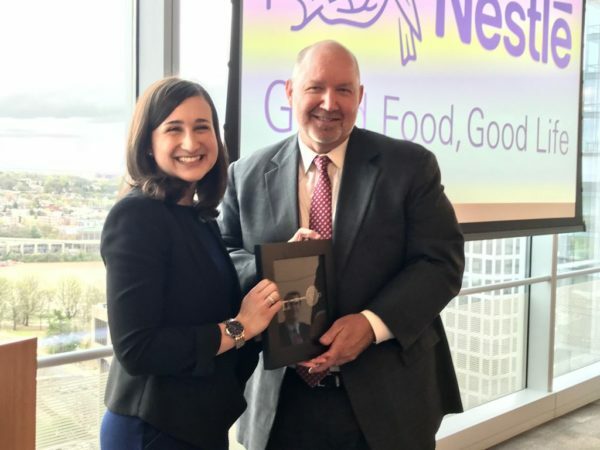 So while she does remain “a little uneasy” about the prospect of “a community like Arlington, that has so much else to offer, seeking to offer cash incentives,” Cristol thinks the Nestle deal does show that these grants can work, if managed properly. Nestle will next report back to the county on July 15, 2019 to affirm that it’s indeed created all 748 jobs it promised for the Rosslyn office.